Click on the first photo to enlarge all photos and read the captions. You must do this first to reveal the mystery. What do all of these things have in common? Can you guess before reading the complete story printed after the photos and captions? Do you even want to? A pan of burned Brussels sprouts. Air freshener and special cat odor cleanser and a bottle of nail polish. What can they possibly have in common? Annie just peed in my shower––I mean a man-sized stream that arced up from where she was standing on the floor in front of the shower, over the 6 inch ledge and into the shower, where it ran from a couple of feet away right down the drain. I shouted, “No, no,” but she finished and ran away. Then I remembered that I’d cleaned out her box this morning in the location where it is located in the guest room shower and had to empty all the sand and wash out the box and under it because there was pee all over the shower floor, probably because all the cats were in yesterday and had used it and it was not pleasant to enter, so she just peed in the shower, or they did. Anyway, I had sprayed ammonia over all the floor and box, scrubbed them both and then sprayed again with an odor eradicator and stood the box on end to dry while the shower floor dried. Then I closed the door so she didn’t go in there while it was drying. Unfortunately, I then left to drive Yolanda home, do a bit of shopping and stop by the fraccionamiento office to see if I’d paid my special assessment. I then stopped by a couple of neighbor’s houses to apologize for Diego’s barking while I was gone–another story–forgetting that I hadn’t opened the door to her guest room bathroom and set up her litter box again, so she had nowhere to pee. She did it in the easiest place to clean. Good girl. Phew. Telling about it took as much effort as doing the two cleanups, but now the plot thickens. Yesterday I knocked a bottle of dark rose-colored nail polish off the counter of my master bedroom bathroom and it dropped and broke on the eggshell-colored ceramic tile of my bathroom, spraying across 8 feet of floor, over the new rug I had just bought in the states, and a bit up the wall. Rapidly drying pools of bright polish and splatters mixed in with shards of glass and tiny pieces of glass made passing through the bathroom to the tub nearly impossible! Damn! How to clean it up without walking through it and cutting my fingers to shreds? I ended up wadding Kleenex and toilet paper and picking up what shards were big enough to see, then used nail polish remover pads to tackle the polish, removing big gobs with Kleenex, then carefully scrubbing with the pads. When I ran out of pads, I put polish remover on wads of Kleenex, but it was a big job. When I had cleared away most of the bigger puddles and largest shards and removed most of the polish off the wall and rug, I had just the decorative splashes left—about 3 feet of them—it occurred to me then that the first thing forgottenman would say when I told him the story was, “Did you take pictures?” No, I hadn’t. So, now that most of the mess was already cleaned up, I did. Secondly, it occurred to me that I should just pour the rest of the bottle of polish remover over the floor and use my foot in my Croc to rub Kleenex over them. I wouldn’t have to worry about glass and could apply more pressure. I finally got it all up and then put more remover down and rubbed over larger areas to remove the stain, as that porous area now sported an overall pinkish glow. Finally, coming up to the present and Annie’s peeing in the shower, when I was mopping up her urine with toilet paper so I could flush it, I found a pretty good sized clear shard of glass from the top part of the jar which had no polish on it to make it obvious, jagged end facing up, in the shower just where I would have stepped when I took my next shower. It had flown up and over the edge and into the shower when the nail polish bottle broke! Good Annie! Her foresight (or hindsight?) in peeing in my shower probably saved me a serious injury. But! Did I really say finally? As I was writing this post, the plot thickened again. Just before I started writing this post and taking the photos to accompany it, I had put a small pan of Brussels sprouts on to steam. Since there were only seven largish sprouts, I used a steamer basket in a small covered saucepan with water up to the bottom of the steamer bottom. I had cut the tops of each sprout almost through to the bottom in an X pattern, and as I sprinkled them with “No Salt,” pepper, garlic powder and a bit of balsamic vinegar, I was remembering the last Brussels sprouts I’d had when I first got to Sheridan two months ago. They were served as an appetizer in a restaurant and since both my sister and Jim, her husband, hate them, it was up to my friend Patty, her boyfriend Duffy and me to polish off the whole batch. That was no problem. They were delicious—piquant and a bit charred with a wonderful smoky flavor. I was wondering how I could duplicate that recipe. Would I steam them first, then char them? What were the spices? For years I’d been using a friend’s recipe which I loved but I liked these even better. At any rate, the present day Brussels sprouts went on the gas stovetop to steam and I went to the bathroom to survey the scene and to write this story, then to my desk in the bedroom to finish it. One thing led to another and a half hour had passed before I finished typing the story. When I came back to the living room to plug in my computer, edit photos and post, I heard a sizzling and rapid rocking sound and smelled a burning smell. Damn! The Brussels sprouts! I quickly turned off the gas under the completely waterless smoking saucepan, removed the sprouts with tongs and took the pan to the sink, running hot water over the charred black inside of the pan. Yes. More hissing and steam, but then, mindlessly, I turned the pan over and ran cold water over the burning hot pan. Instantly, an explosion of steam so intense that it removed the color from the outside of the enamel pan that was nearest to its bottom. Luckily, I had a huge box of baking soda and two partially full bottles of cider vinegar. Into the pan they went with the expected chemical reaction: rapidly swelling foam and more hissing. I did a rigorous scrubbing with a scrubber sponge and Spongedaddy, using lots of muscle power as well as more soda and vinegar. Scrub scrub scrub. Although I got some of the char off the sides, I made little progress with the bottom of the inside of the pan. This entry was posted in cat, Story, Uncategorized and tagged Accidents, Annie, Brussels sprouts, Kitty litter, Mystery, Recipe, Story on November 21, 2018 by lifelessons. Photos may be better viewed by clicking on them to enlarge them. Obsequious’s opposite, a cat has got its pride. The moment that you put it out, it wants to be inside. Then once inside it sees something outside it has to play with. Each thing that you have planned for it is something it can’t stay with. consent to go outside again until you’ve cleaned the mess. And cats have no contrition. No impulse to confess. but afterwards they’re guilty and they’ll woo you if they’re able. But try illuminating cats regarding what they’ve done. They will survey you blankly and go on to other fun. A cat has grace and beauty , but very little soul. laid out for your viewing, on your front doormat. Cats move with grace throughout your life, doing what they please. When you least need their presence, they’re there upon your knees. and sometimes when you pet them, they will consent to more. A cat’s a living work of art, draped across your stool. “Do unto others as you wish” is their golden rule. So don’t expect a thank-you as you stroke their ruff. To be graced with their presence should be thanks enough! This entry was posted in cat, cats, Humor, humorous poem and tagged cats, daily addictions, FOWC, Humor, humorous poem, images of cats, Poem about cats, Word of the Day Challenge on September 23, 2018 by lifelessons. To read the poem that goes with these photos as well as to enlarge the photos, you must click on the first photo and then on each arrow on the right hand margin of each photo. If you are viewing via Facebook, you won’t see all the photos or the captions/poems unless you click on my URL or the name of my blog first. Facebook only shows a few of the photos unless you do this. This post is for forgottenman, who asked for it! While my human enjoys company, I hide out here instead. For the two days they visit, I remain under the bed. I only see their legs and feet. I can’t see any more, and after two days, I’m relieved as they walk out the door. I wait here for my mistress, gazing at the wall, But when I go to look for her, she isn’t here at all. She’s gadding with some other friends, forgetting little me. I gaze through this funny window, but there’s nothing there to see. The minute she gets home again, I let her know my wishes. We three need attention––I and my two dishes. She fills them up and they fill me. She’s off again and doing, and so I go in search of her to do a little mewing. She has her little window balanced on her knees. I try to move in closer to see whatever she sees. Hours later, she stirs herself and I wonder what for. I do not wander after her, but stop at the back door. She’s joined these raucous people who line up to watch the sun fall into the ocean, cheering when it’s done. They get a little rowdy while emptying their glasses, filling them again each time Senor Tequila passes. They’ve made a little beach bar of a long plank and some logs, and on the other side of it, they fraternize with dogs!!!!! of catfood she has brought with her, surveying them and hopin’ that when she comes inside again, she’ll pry one of them open. When she comes in again, I’m glad she finally settles down, so I jump up to dig my claws into her dressing gown. This entry was posted in beach poems, cat, cats, Cats & Dogs and tagged Annie, Beach Sunset, cat, Daniel's Sunset Bar, IMAGES OF LA MANZANILLA, poem about a cat, poem about cats and dogs on January 18, 2018 by lifelessons. 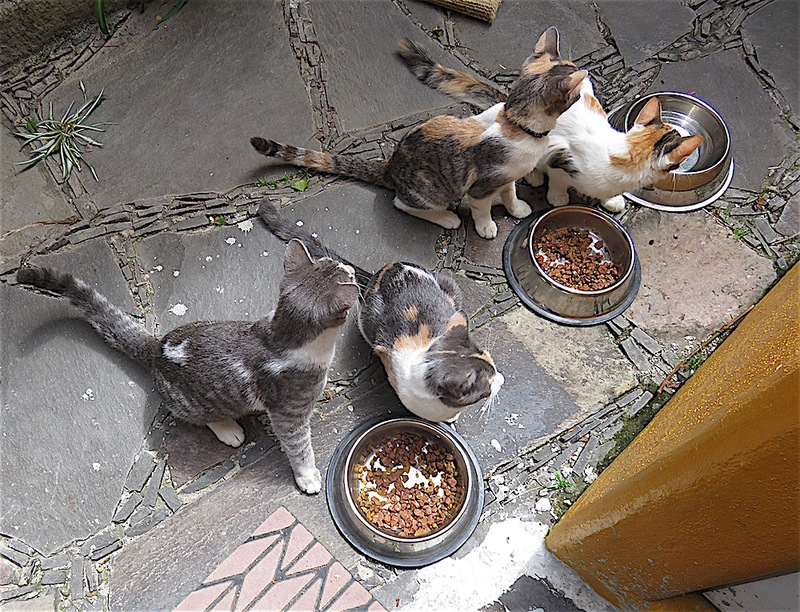 The story of the four kittens abandoned on my doorstep 3 1/2 months ago continues. As you can see, they are barely kittens anymore, and once they’d had all their shots and been neutered and spayed, it was time to make their transition outside. I knew there were dangers, but 5 cats inside is just too much for me to handle anymore, let alone for housesitters allergic to cats to handle, so the day came when they were finally let out to the wide world as it existed within my compound walls. I am hoping they won’t be tempted to go over the walls but know it is inevitable. A bigger worry is that they’ll venture into the backyard where Morrie and Diego are accustomed to dealing with animal interlopers in a predictable manner. I’ve kept sliding glass doors open (screens and bars closed) hoping they’ll get used to each other, but the dogs are jealous, curious, and, well, they are dogs. Here are the events as they have unwound over the past week, ending yesterday. All in all, a scary day. We’ve been having a pretty cushy life as house cats for the past four and a half months. Mom forgives us when we pull down her books and we like naps with her. Yet sometimes, we look out and wonder about what we see out there. Some of the things out there are curious about us, too. That day came when suddenly all those doors to the front of the house formerly closed to us were opened. she couldn’t keep us out of, because there were also bougainvillea vines we could climb up for access to the garage. All in all, it was fun finding places to make our own. were mirrored in the backyard. And we were so curious. And that is where the story starts. Click on the X at the top right of this photo and read below to see its middle and end. Heartsick. When I went out to feed the kittens this morning, only two showed up. I put out the food, which usually brings them out, but Ollie and Kukla never appeared. I called out over and over, opened the garage door, looked outside, nothing. I was sobbing by the time I thought to pen the dogs up and look in the backyard. It was the worst sort of suspense thriller–the kind of movie I hate–as I combed every inch of the backyard, expecting to find their little bodies everywhere I looked. I had heard the dogs take after something last night and a loud screech, and I had brought the dogs in immediately, but the screech was not catlike and when I called out for kittens, no one answered. Now I regretted not looking closer last night. I looked everywhere again. As I searched behind the studio, both dogs came around the back way as though they were helping me to look, but nothing. I wondered if the cats had gone hunting in the lots across the street because I was a half hour late in feeding them this morning, thanks to my spider poem. Finally, I went back to the house and let the dogs out, then once again combed the plants around the studio. Diego kept running behind a monster pot containing aloe vera on the terrace near my bedroom, and eventually Morrie joined him. Beside it were two other pots too large to move and they were all tangled up in the thunbergia vine that covered the wall, all of the tall plants around the studio and behind my bedroom, and also had grown up the telephone post and along the wires. I tried to pull the pots back but they were too heavy. I finally pulled one smaller palm pot out and searched behind all the pots. Nothing. But, I thought I detected a tiny squeak. I put the dogs in again and went back and repeatedly called “Kitty, kitty, kitty.” Finally, Ollie jumped down out of the vine tangle and nonchalantly strolled across the patio, looking very closely for dogs. I called again and a few minutes later, Kukla joined us. I was so relieved!!! I carried them around the house as I’d exited through the doggie domain and was not about to carry them through the room occupied by Morrie and Diego. I put them in the front yard, closed both of the barrier gates, let the dogs out and put the two wayfarers into the house so I could feed them separately from their sisters, who had already eaten. When I went out to get a collar to put on Kukla, however, the other cats got in, so I put another dish of food out, got a collar on Roo and Kukla but not Ollie. Fifteen minutes later, Frannie is the only one who has kept hers on for two days. The rest of the collars are lost somewhere out in the cat jungle. Phew. Motherhood. This entry was posted in cat, cats, Cats & Dogs and tagged cats, dogs and cats, images of cats, lost cats, stories about bad dogs, stories about cats on October 2, 2017 by lifelessons. Kukla, Fran, Ollie and Roo are home after 24 hours at the neuter and spay spa—newly clipped and snipped and seemingly feeling no pain. After three months of life either in the house or in the small walled-off area outside the guest bedroom (and kitten suite) barred but with screen land glass sliders left open door, the vet says it is now okay to release them to their greater environment within my compound walls. They have a new outside sleeping room, but as you can see, are still curious about their old digs as well. Frannie has decided to stay inside with me for now. That’s her tail you see curling around over my screen. They were at first suspicious of their food bowls placed outside, refused to eat, then gave in to hunger and ate, but refused their next meal which was being devoured by ants, so I moved it inside. I let them roam inside and out, then locked them out, now have let them in to sleep and left screen open but closed the door to front garden so their outside area is, as before, secure. Except for bats. Cross your fingers. Below the poem are probably too many photos depicting their first afternoon of freedom, including a bit of dialogue with the dogs. time to reexamine everything they’ve known. has suddenly been opened up, its wonders all unfurled. They must examine everything in this big new place. Unearth all its mysteries and all its dangers face. What are their dishes doing lined up here outside? This alfresco dining is something they can’t abide. All these swaying branches. This long wall to explore. To peek in and to crawl through. To paw at and to pat at. there are so many different things to puzzle and astound them. becomes their playground once again––once more their status quo. Walls protect them all for now from street dogs and from cars. Morrie and Diego peek out from behind bars. to turn this split menagerie into a family. But five months old now, time to face that other world without. Time for them to discover what the real world is about. Discovery of their first upended litter tray, quickly outgrown. Something interesting always to be found in the drain. Always interesting stuff to knock down in the sala. Bob’s spirit sled sculpture would make a great scratching post. Aha! A zoo!!! What weird creature this? Luckily, too large to get more than their heads through the bars. Cats could get through but haven’t tried. Yet. Hmm. We’re at the zoo, but are we in front of the cage or in it? Paver stones make great back scratchers. Sniffing out game to track. Kukla couldn’t resist jumping up on the propane tank but promptly slid back down again. Aha.. their cage has an outside viewing area as well! Getting back to my jungle roots. Dining room table covered with Mom’s fast shopping expedition. What can I get into here? She always shoos me off the tables and counters. What are our food and water dishes doing outside? We prefer inside dining. Return to old haunts. We know our way around here! What did Mom have for breakfast? What’s kept her too busy to clear away her dish? Frannie eluded the others and got inside before I shut the door. Is Mom watching? Oops. I’ll just hide again. This entry was posted in cat, cats, Cats & Dogs, humorous poem, humorous poetry, Humorous Rhymes and tagged cats, dogs and cats, images of kittens, photos of kittens, poem about kittens on September 7, 2017 by lifelessons. Boxing Day with Kittens. Kitty Videos!!!! Frannie was sitting on my lap while I was trying to put the video of her and her siblings on YouTube. Suddenly, she seemed to notice she was a media star and jumped onto the keyboard to watch. This entry was posted in cat, cats and tagged cats, kitten videos, Kittens on July 26, 2017 by lifelessons. The prompt today is scamper. 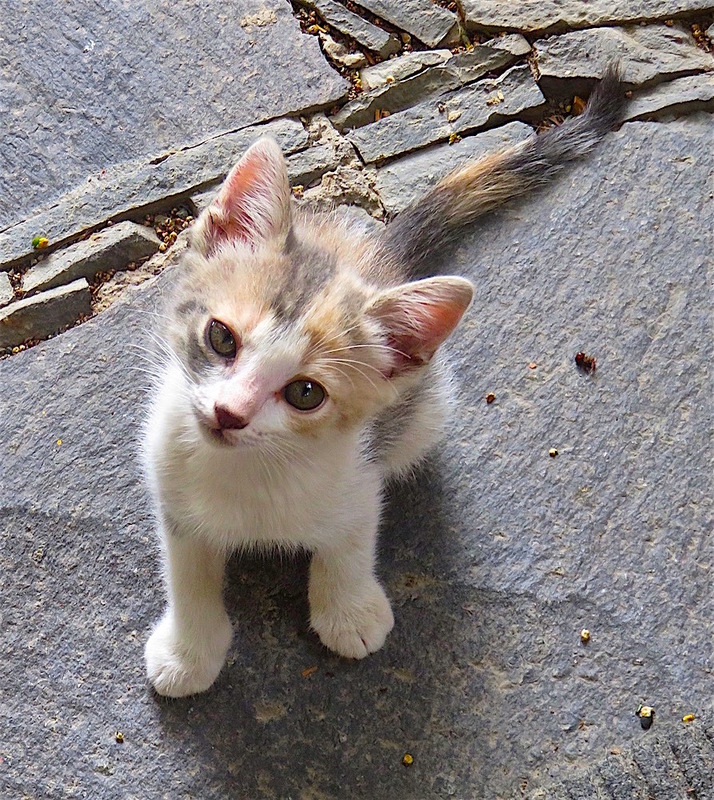 This entry was posted in cat, cats and tagged Daily Post, Daily Prompt, kitten, kitten images, photos of kittens, poem about kittens, scamper on July 2, 2017 by lifelessons.